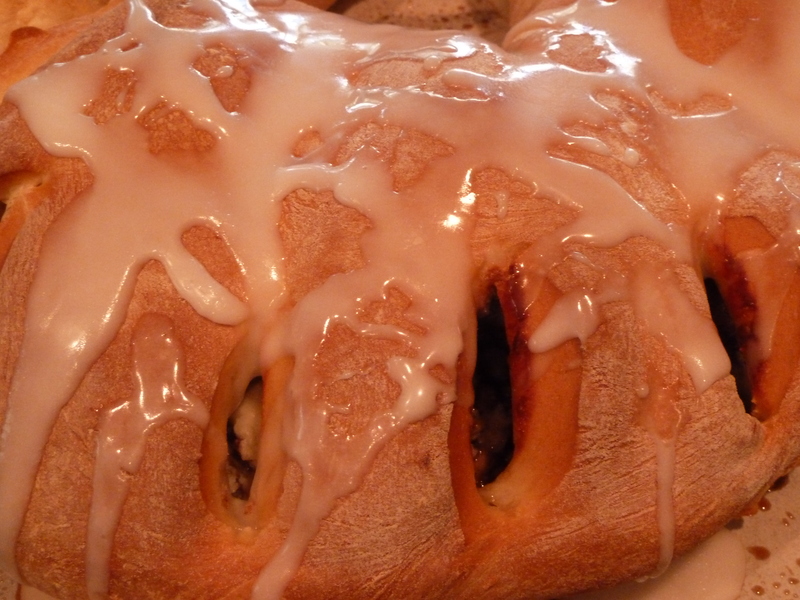 cream cheese king cake | Is there any wine left? 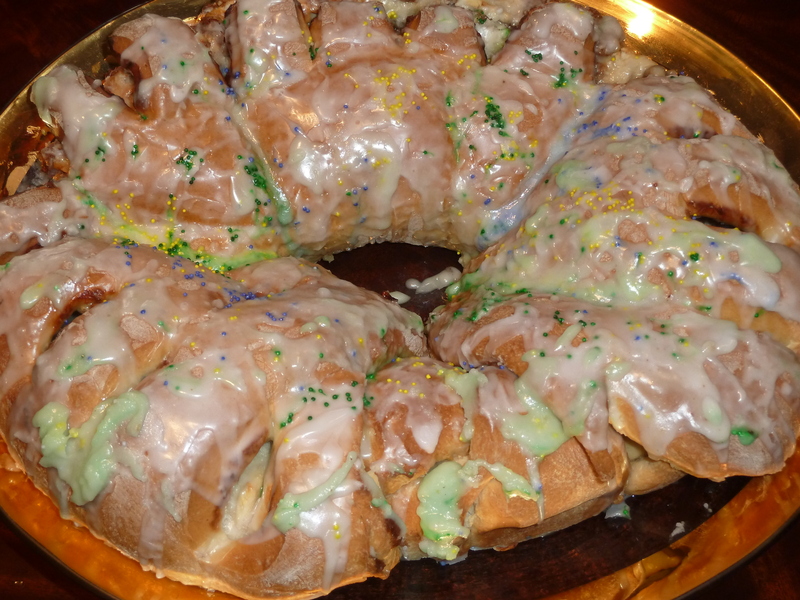 Every Louisianan knows what Epiphany brings… King cake season! 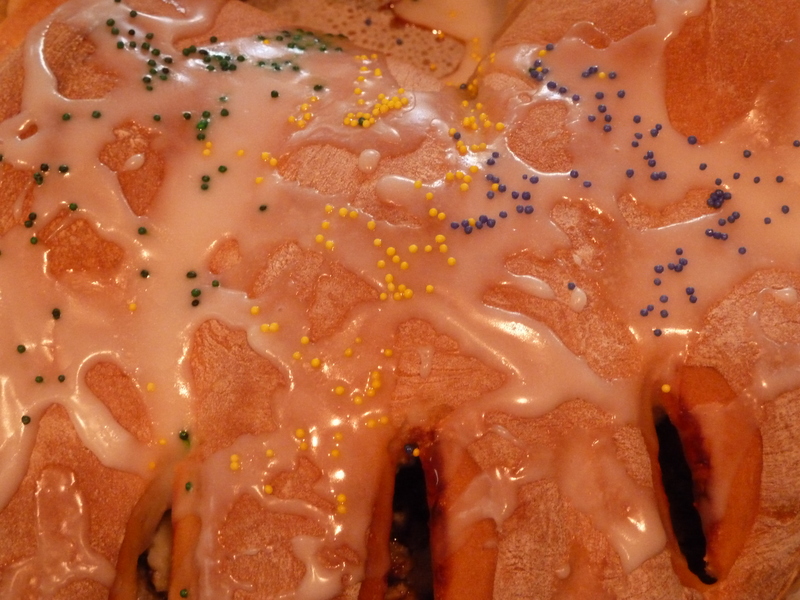 King cakes, a Mardi Gras tradition, are similar to cinnamon rolls. Generally they have a plain cinnamon filling, but the fillings can include cream cheese (like this one), apple, lemon, praline or strawberry. The most important part of the king cake is the little plastic baby hidden inside. It symbolizes the baby Jesus. Tradition says that the person that gets the baby in their piece has to bring the king cake to the next gathering. My favorite king cake in the world is from Manny Randazzo’s in New Orleans. It is so rich and just melts in your mouth. I just had a piece of one last week (thanks, Aunt Frannie and Mary!) and it inspired me to make one at home! If you want good king cake in Texas (or anywhere other than southern Louisiana, for that matter) you have to have one shipped to you or make it yourself. The things that they try to pass of as king cakes around here look like colored cardboard. They taste even worse than that, if you can believe it. I “cheated” and used frozen bread dough to save time. Don’t let anyone tell you that they can tell the difference. They can’t. In fact, don’t even tell anyone that you didn’t make the bread dough. It can be our secret. The bread dough can be found in the freezer section of your grocery store. A couple of days before you want to make the king cake, stick the dough in the refrigerator and let it defrost and rise. 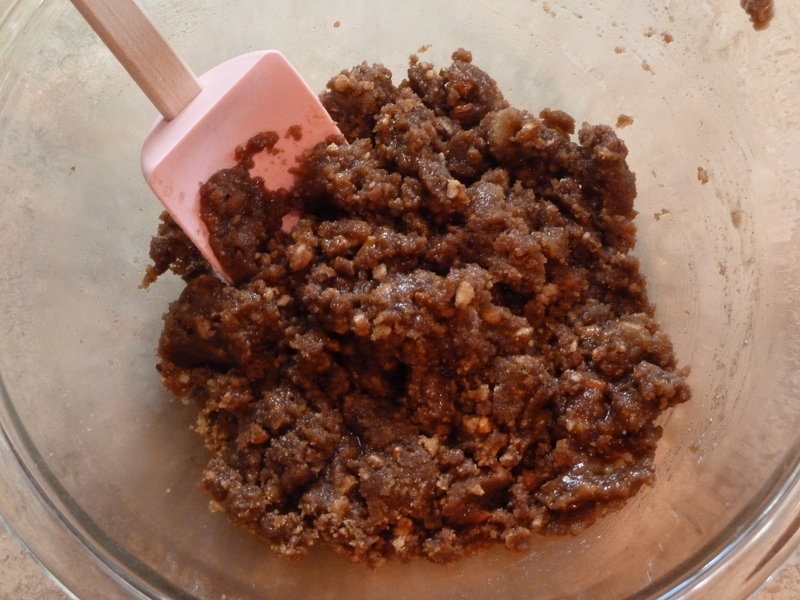 Make the cinnamon filling by combining the flour, brown sugar, cinnamon and chopped pecans. Pour the melted butter in the bowl and mix until crumbly. Set aside. 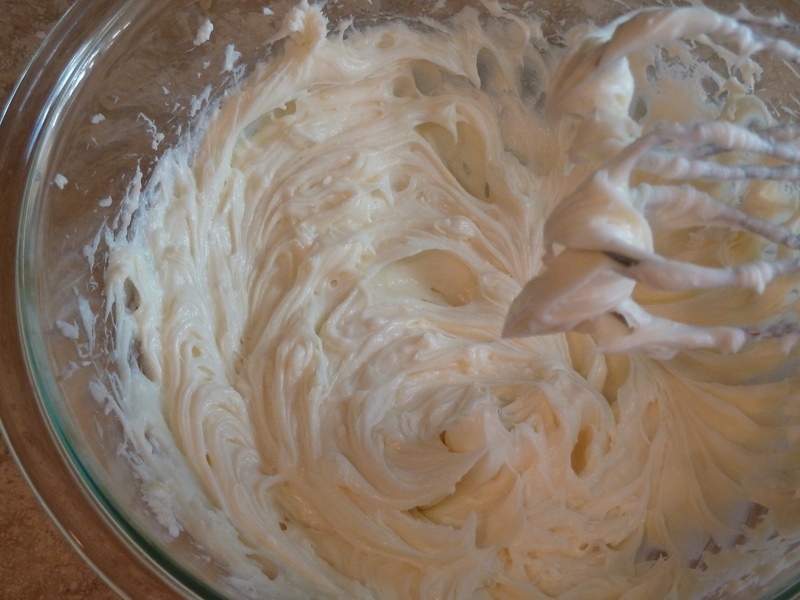 To make the cream cheese filling, combine the sugar, vanilla, lemon zest and softened cream cheese. Beat until smooth using an electric beater. Set aside. And resist taste testing the whole bowl. 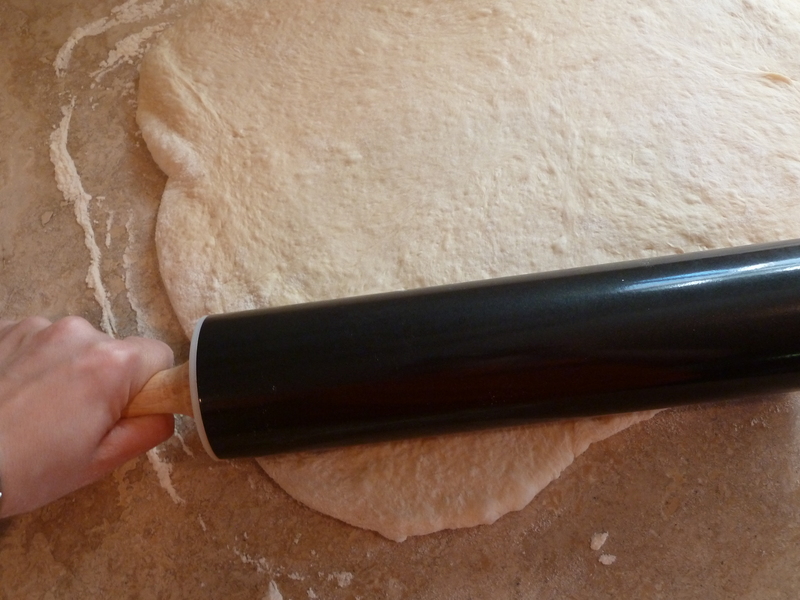 On a floured surface, roll out the bread dough into a 12″ x 18″ rectangle. 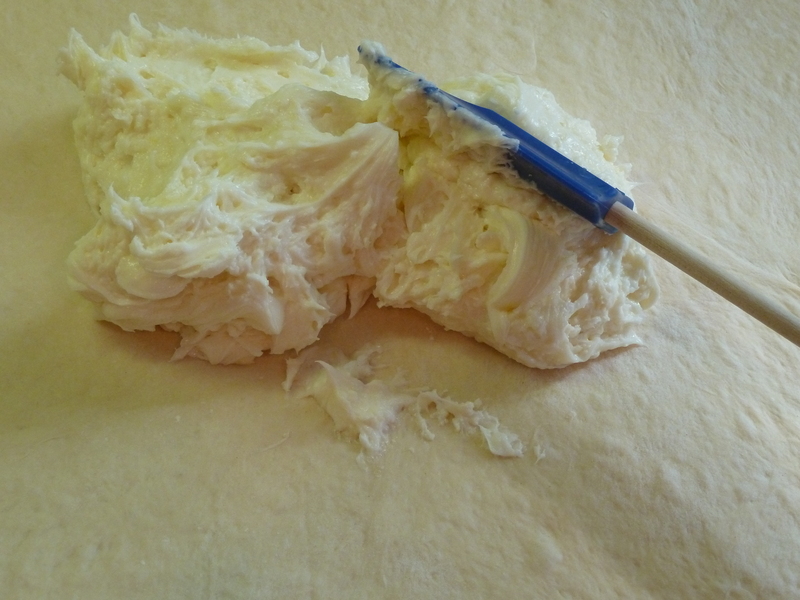 Using a spatula, spread the cream cheese filling in an even layer. Sprinkle the cinnamon filling over the cream cheese. Disclaimer: My forté is cooking, not photography. I couldn’t do anything with this shot to make it look like anything other than ground meat. It’s not. 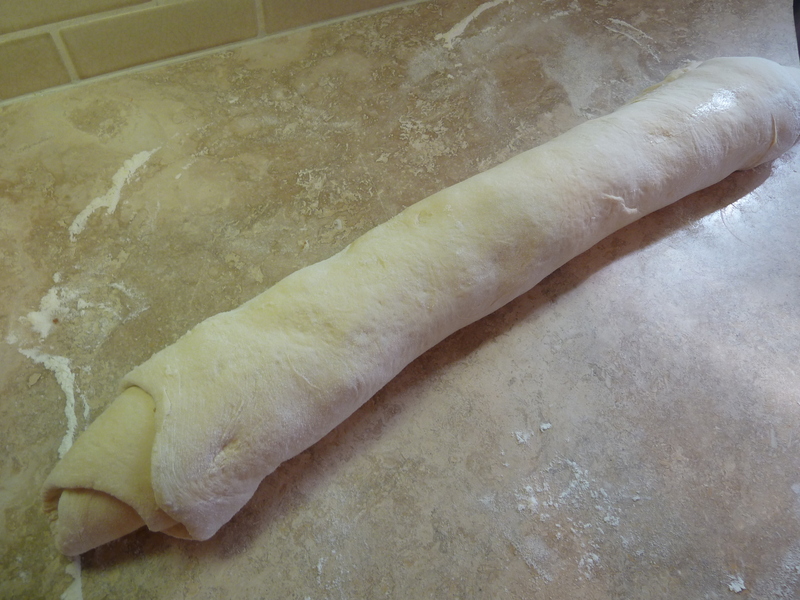 Starting with the widest side, roll the dough tightly light a jelly roll. Bring each end of the roll together to form an oval-shaped ring, seam side down. Place the ring on a parchment paper-lined baking sheet. Using scissors, make cuts 1/3 of the way through the ring at 1-inch intervals. The dough still needs to rise a second time. 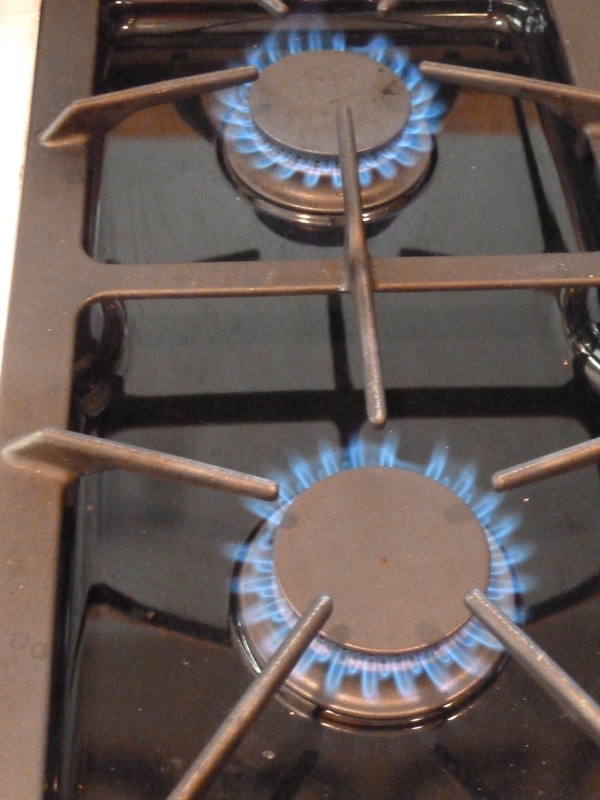 When I need something to rise, I like to turn on the gas burners for a few minutes and let the stovetop get warm before putting the baking sheet on the range. Once the dough has risen for an hour, bake the king cake for 50-55 minutes at 350 degrees F.
While the king cake is in the oven, combine the powdered sugar with a tablespoon of water to make a smooth frosting. This was the point when I started thinking about the baby that belongs in the king cake. Surprisingly, I didn’t have a little plastic baby lying around. I didn’t even have a dried bean. I didn’t want the king cake to be baby-less, of course, so I scoured my pantry for something I could use as a stand-in. At first I couldn’t find anything, but then found a bag of stale pretzel M&Ms. Jackpot! When the king cake comes out of the oven, use a spatula to lift a portion of it slightly up. 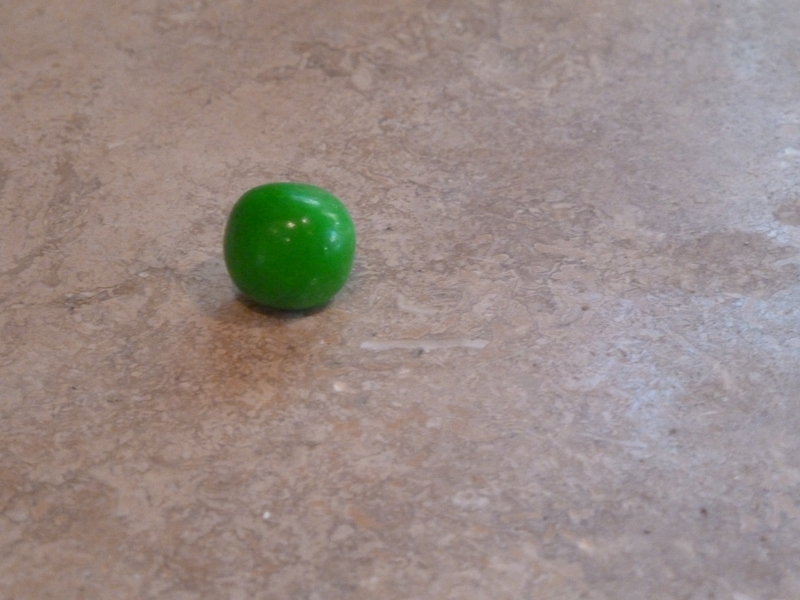 Stick the plastic baby or bean (or pretzel M&M) into the bottom of the king cake. Frost the king cake while warm with the powdered sugar frosting. Scatter the sprinkles on the frosting before it dries. 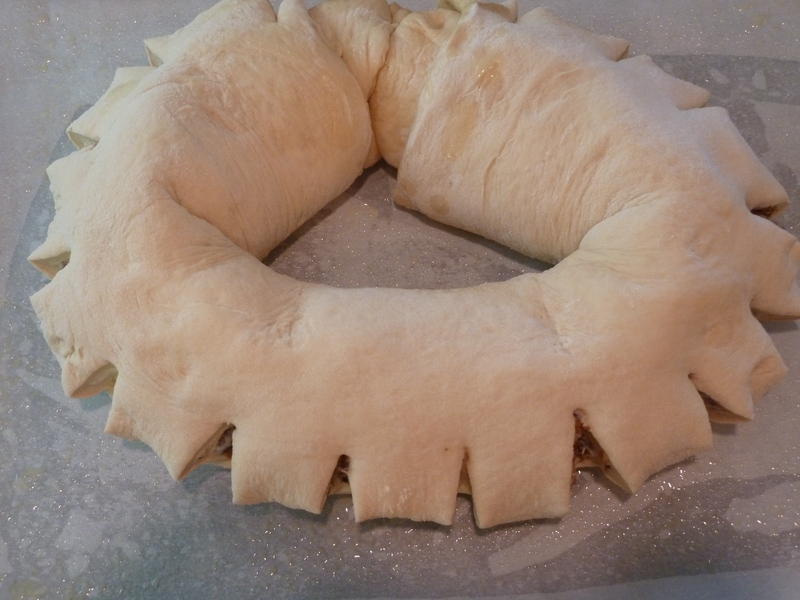 A day or two before you plan to make the king cake, pull the bread dough out of the freezer and refrigerate. It will rise in the fridge. Preheat oven to 350 degrees F . Line a large cookie sheet with parchment paper. 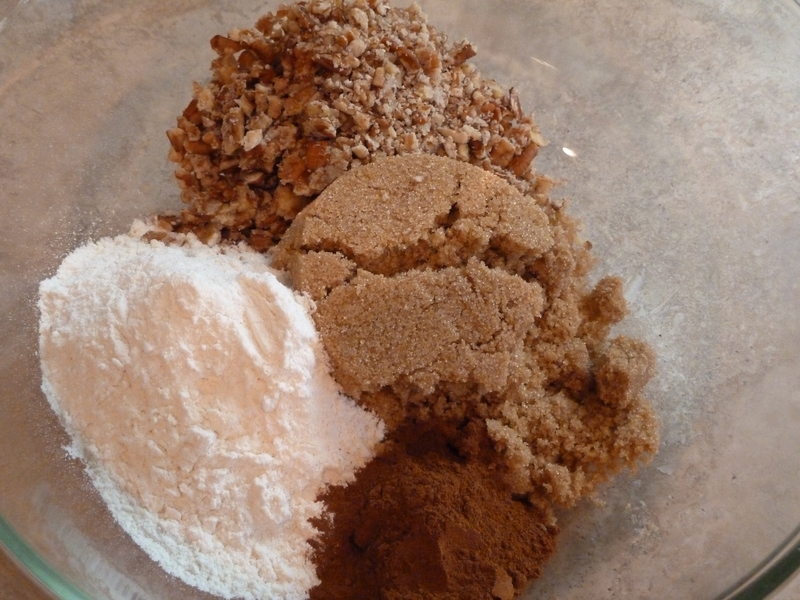 To make the cinnamon filling, combine the brown sugar, ground cinnamon, chopped pecans and 1/2 cup flour. 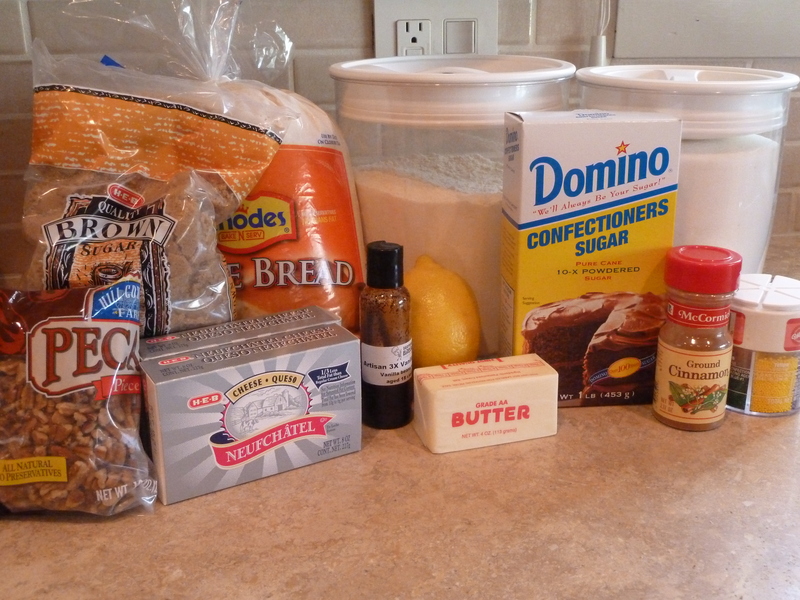 Pour 1/2 cup melted butter over the cinnamon mixture and mix until crumbly. Set aside. 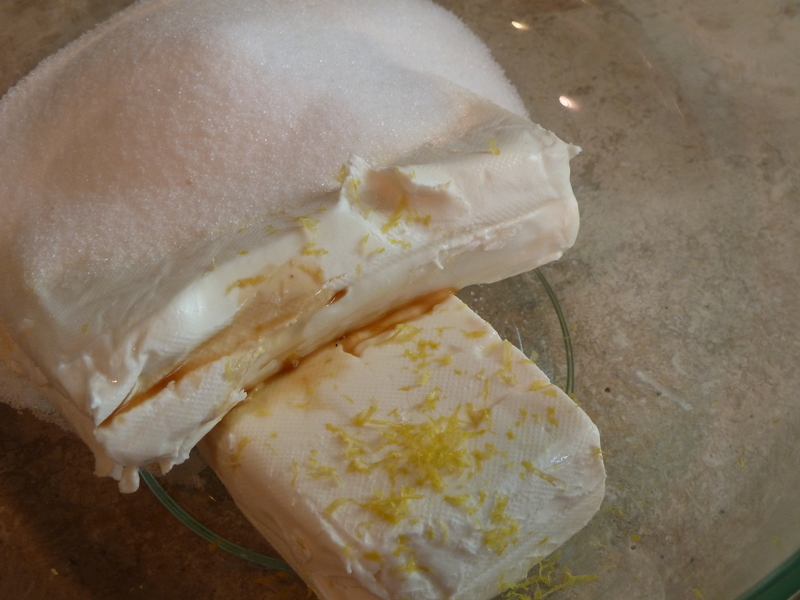 To make the cream cheese filling, beat the cream cheese with the sugar, lemon zest and vanilla until fluffy. Set aside. 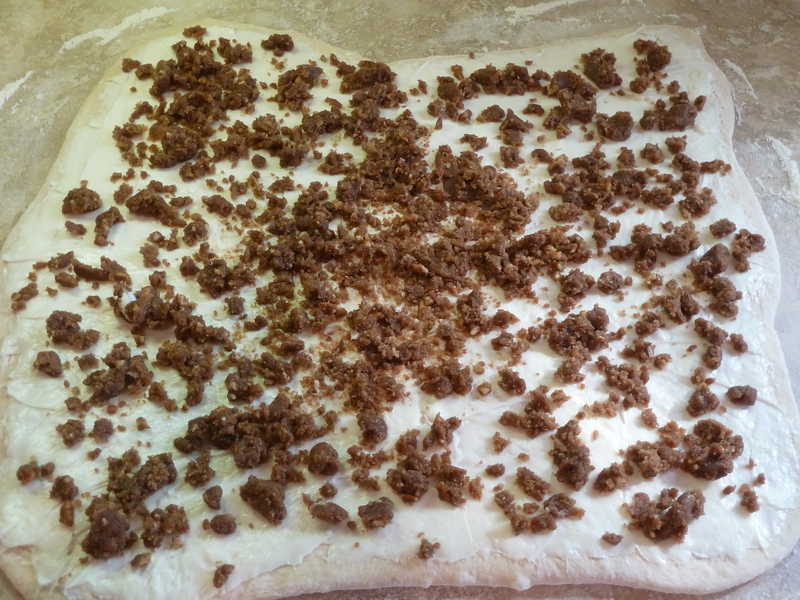 Lightly flour a smooth surface and roll out the bread dough into a 12″ x 18″ rectangle. Using a spatula, spread the cream cheese filling in an even layer then spread the cinnamon filling over the cream cheese. 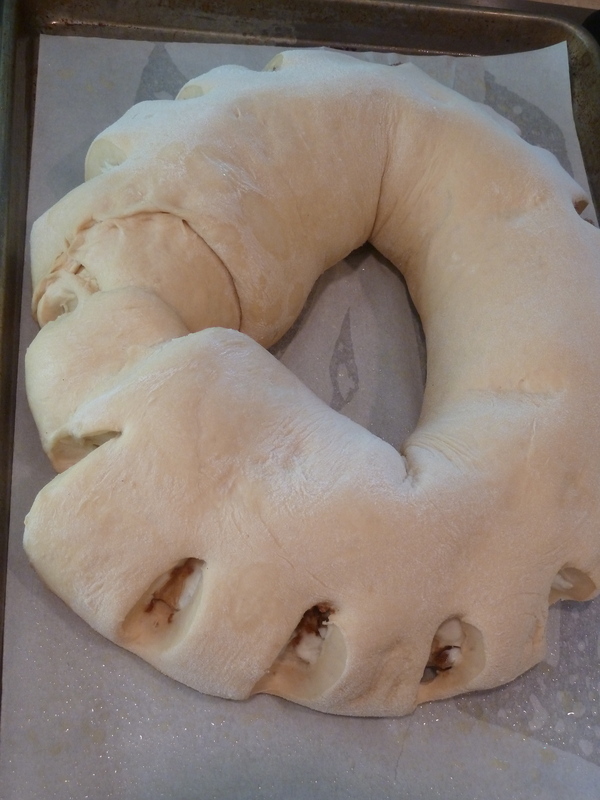 Starting with the widest side, roll the dough tightly light a jelly roll. Bring each end of the roll together to form an oval-shaped ring, seam side down. Place the ring on the parchment paper. Using scissors, make cuts 1/3 of the way through the ring at 1-inch intervals. Let rise in a warm spot until doubled in size, about 1 hour. When you remove the king cake from the oven, use a spatula to lift a portion of it slightly up. Stick the baby or bean into the bottom of the king cake. Frost while warm, then sprinkle with purple, green and gold sprinkles. ← pepper bacon green beens and valentine’s day shout out!